The Chicago Bears were off to a 4-0 start as they faced the Buccaneers in Tampa Bay on October 8, 1989. Head Coach Mike Ditka’s team had won in double-digits in each of the previous five seasons, including a NFL Championship in 1985, and was used to contending. While colorful QB Jim McMahon, who often clashed with Ditka, was dumped off to San Diego during the preseason, the powerful defense still contained many of the veteran stalwarts from the title-winning team, including DE Richard Dent, DTs Dan Hampton and Steve McMichael, and MLB Mike Singletary. 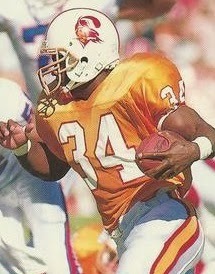 The Buccaneers, under third-year Head Coach Ray Perkins, had not been nearly as successful. They were 2-2 as they faced the Bears, but were a perennially losing club that had last been over .500 in the strike-abbreviated 1982 season. Moreover, they had been beaten by Chicago twelve straight times. QB Vinny Testaverde had gone through plenty of growing pains after being the first overall pick of the 1987 NFL draft, and while he was showing improvement, he was coming off of a poor performance the previous week in a loss to the Vikings. There were 72,077 fans in attendance at Tampa Stadium. The Bears went three-and-out in their first series and, following a short punt, the Buccaneers took over with good field position at their 47. Vinny Testaverde completed all five of his passes in a six-play possession with the last one tipped by RB Lars Tate and caught by WR Mark Carrier for an 11-yard touchdown. Donald Igwebuike’s extra point made it 7-0 for the home team. Chicago again had to punt and once more the Bucs drove to a score, this time covering 69 yards in seven plays. Testaverde threw to WR Bruce Hill for a 41-yard gain to the Chicago 17, ran for 12 yards on a third-and-six play, and FB William Howard dove into the middle of the line for a one-yard TD. It seemed as though Tampa Bay would be able to pour it on after, on the third play of the ensuing Chicago series, WR Dennis McKinnon was stripped after gaining 17 yards on a pass from QB Mike Tomczak and FS Harry Hamilton recovered for the Buccaneers. Testaverde immediately went to the air and connected with Carrier for a 30-yard gain to the six and a penalty on the Bears made it first-and-goal at the one. But Chicago’s defense stopped four straight running plays and the Bucs came up empty. The reprieve for the Bears was a short one as they turned the ball over again three plays later when Tomczak was intercepted by SS Mark Robinson to give Tampa Bay the ball at the Chicago 14. This time, as the game moved into the second quarter, the Buccaneers didn’t fail to capitalize. Testaverde threw a play action pass to TE William Harris for a touchdown and Igwebuike’s conversion made it 21-0. The Bears were still unable to get anything going on offense and punted. But now it was their turn to make the most of a turnover as LB Jim Morrissey intercepted a Testaverde pass and Chicago had the ball at the Tampa Bay 27. Five plays later, the Bears got on the board when RB Neal Anderson (pictured at left) ran for a five-yard TD. A short Tampa Bay series ended with a punt but the Bears once again turned the ball over when Tomczak fumbled while being sacked by LB Kevin Murphy and DE Reuben Davis recovered at the Chicago 28. While a tipped pass was nearly intercepted by LB Mike Singletary, the Bucs scored another touchdown, this time on a Testaverde throw to Hill from 22 yards out. Down once more by three touchdowns, the Bears responded by driving 64 yards in seven plays. Anderson had a 19-yard run on a sweep to start things off and Tomczak threw to TE James Thornton for a 34-yard gain to the Tampa Bay 9. Anderson ran for a one-yard TD and, with Butler’s second successful PAT, the score was 28-14 and remained that way at the end of the half. On Chicago’s first possession of the third quarter, the Bears went 54 yards in six plays to cut the margin further. Tomczak threw to RB Thomas Sanders for a 16-yard touchdown and, with the PAT by Butler, Tampa Bay’s lead was down to 28-21. That was the score entering the fourth quarter, but a short punt gave the Buccaneers the ball at the Chicago 44 and, four plays later, Tate ran for a 16-yard touchdown. Following a short series by the Bears, the Bucs drove to another TD, this time covering 80 yards in six plays. Tate (pictured at left) took off for a 48-yard gain on the first play and Testaverde converted a third-and-three situation with a completion to Hill for 12 yards. Tate finished the possession off with a four-yard run and when the snap on the extra point sailed high, holder Chris Mohr ran the ball into the end zone. Tampa Bay had a commanding 42-21 lead with under seven minutes left on the clock. The Bears fought back as Jim Harbaugh replaced Tomczak at quarterback. Throwing on almost every down, the visitors went 74 yards in nine plays. Harbaugh completed four passes and, after being sacked to force a third-and-15 situation, he escaped pressure and ran for a 26-yard touchdown. A short series by the Bucs gave the ball to the Bears one more time and they again drove to a score, this time on a one-yard carry by Anderson, but the ensuing onside kick with 53 seconds remaining was recovered by the Buccaneers. Tampa Bay held on for a 42-35 win. The Buccaneers led in total yards (415 to 350) and first downs (27 to 22). They had the edge both on the ground (147 to 136) and through the air (268 to 214). Chicago turned the ball over three times, to two by Tampa Bay. Vinny Testaverde, who left the game midway through the fourth quarter after taking a hit from Steve McMichael, completed 22 of 36 passes for 269 yards and three touchdowns with two interceptions. Bruce Hill and Mark Carrier (pictured below) had nearly identical numbers as they each caught 6 passes and scored a TD while Hill accumulated 107 yards and Carrier had 105. Lars Tate also had a fine performance as he ran for 112 yards and two scores on 18 carries. For the Bears, Mike Tomczak was successful on 16 of 29 throws for 162 yards with a TD and an interception. Jim Harbaugh, in his relief performance, completed 6 of 8 passes for 65 yards and also ran the ball three times for 34 yards and a touchdown. Neal Anderson rushed 17 times for 86 yards and three TDs and also caught 6 passes for 30 more yards. WR Ron Morris gained a team-high 54 yards on his three receptions. “This is the kind of win we’ve been looking for, the kind of win to get us over the hump,” said a jubilant Ray Perkins on behalf of the Bucs. “We were out-coached and out-played. It’s as simple as that,” was the response of a terse Mike Ditka regarding Chicago’s performance. The hoped-for turnaround in Tampa Bay’s fortunes did not materialize as the Buccaneers lost their next five games in a row, finally winning in their rematch with the Bears. They ended up at the bottom of the NFC Central with a 5-11 record. The loss did prove to be a turning point for the Bears. They lost their next two games and won only twice more the rest of the way to finish just a step up from the Bucs in the division at 6-10. 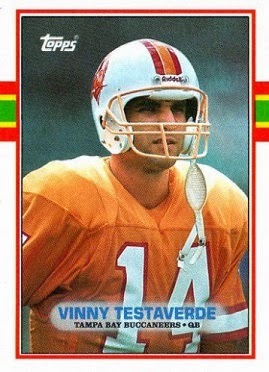 Vinny Testaverde ended up throwing for 3133 yards and 20 touchdowns, but with 22 interceptions. 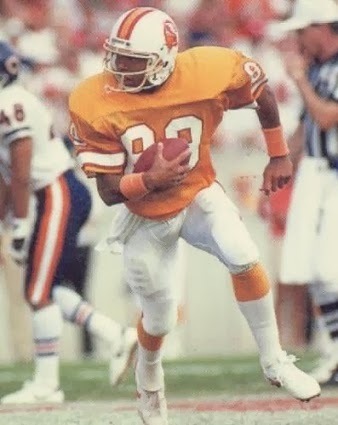 Lars Tate’s rushing total against Chicago was the best of his brief career as he gained 589 yards. Mark Carrier went on to receive Pro Bowl recognition with 86 catches for 1422 yards (16.5 avg.) and nine touchdowns but Bruce Hill was less consistent and caught 50 passes for 673 yards (13.5 avg.) and five TDs. 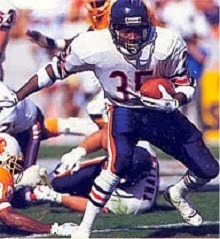 In the midst of the down year for the Bears, Neal Anderson rushed for 1275 yards on 274 carries (4.7 avg.) and had 50 catches for 434 yards. He scored a total of 15 touchdowns and was chosen to the Pro Bowl for the second straight year.